I'm opening Crypts of Indormancy to pre-orders. Having half the job done by the time the books arrive would be a huge help, so that's what I'm doing. You can get it from the Melsonian Arts Council shop in print & PDF or just PDF on its own, or you can go to that other place and buy it, if you insist. The tomb of Thuuz, Lord Nanifer, Elven General of the Western Isle, has been found. The Islanders he once exploited and terrorised would gladly hurl his bitter carcass back into the ocean. Others, hearing of an untouched crypt in the mountains, no doubt filled with all the pomp and pride of an aristocratic burial, arrive with less ideological motives for defilement. Crypts of Indormancy is a location-based adventure possessing ecumenical compatibility with Dungeons & Dragons and its descendants. Appropriate for any number and level of players, all who enter the tomb of Thuuz without their wits ready will likely come undone. For Thuuz’s heirs did not leave his bones helpless and unguarded. 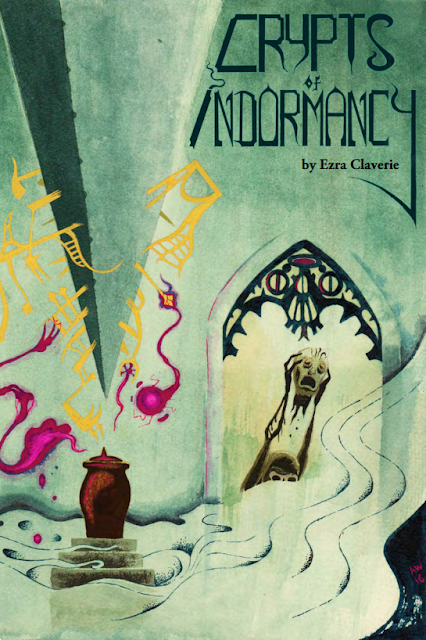 Crypts of Indormancy is written with the relentless wit of Ezra Claverie and illustrated by Andrew Walter’s unbidden alien hands. Never before has such a conjunction occurred and for all our sakes pray it never does again lest our feeble minds slough away like wet cake in a rainstorm. Let's see, what else can we say? It's published in the UK. This should fill you with 80s nostalgia for when that wasn't an unusual thing to say. Gimme all your money and I'll try to fix that. 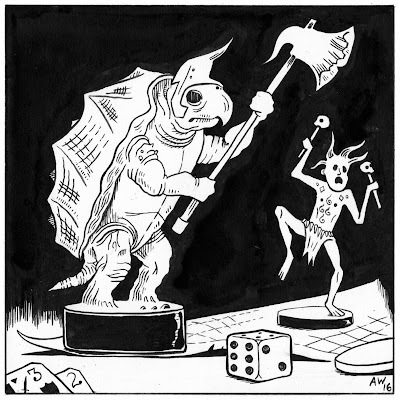 The Kickstarter did well enough that it won't bankrupt the Melsonian Arts Council if it fails miserably. Which is nice. Though please don't let that stop you. Inform your friends, buy some for your neighbours, post it on all those internet places the cool kids go to, take pictures of yourself playing it and having the most wonderful time imaginable with a look that says "oh aren't you envious, you too could be having as much fun as I, but you can't because they all sold out in, like, a day and Dan retired to the peak of Mt Snowdon, Ezra died in a debauched tour of the riviera and Andrew became a caricaturist at South End who never makes any money 'cos all he can draw is unfailingly accurate and cheerful scenes of his customer's death." Yea. Do that.